Brian Clancy appears in Colorado's best Irish Pubs throughout the year. On a monthly basis he performs in Colorado Springs and sometimes Denver. 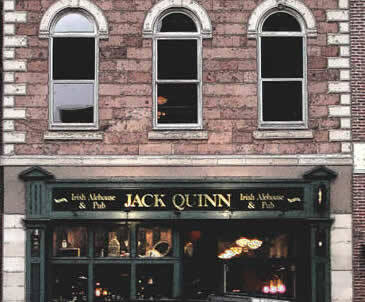 Join us to celebrate the 21st Anniversary of Jack Quinn! Trade Your "I Survived the Bomb Cyclone" t-shirts tonight for Jameson Gear. Tune up for St. Patrick's Day with Brian Clancy and Irish Row. We're driving the snowdrifts out of Colorado Springs! Join us! 21st Anniversary Party at Jack Quinn, with Irish Row. 7:30 PM. If I had my life to live over, I'd live over an Irish Pub. A raucus and exciting evening of live Irish music. Here's a new collection of our ballads and pub songs that is very much unique to our own style and selection of Irish music. Donncha Lynch Band from Cork also appears.